Ventilation is a critical factor in raising all types of livestock, and increasing profitability. In 2008, Harm and his wife Jennifer, and their two sons left Holland to immigrate to Canada to seek the opportunity to start their own business. Growing up on a dairy farm, Harm realized his heart was in the agricultural business. After many years of being a sales and service manager for a local company in ventilation systems, he decide that in 2015 he was ready to start his own business. Huron Ventilation Systems covers customers in South-Western Ontario and the Netherlands with sales and service. The principle of the heat exchanger is based on the transfer of heat by conduction. Heat must be transferred through a wall with the intend for heat recovery. With a Plettenburg heat exchanger it is possible to heat or cool 100% fresh outside air. This results in an optimal climate in the shed. The fresh outside air is heated by exhausted shed air aiming to get the highest efficiency on heat recovering. The fresh outside air passes through a packages of tubes and is heated by the exhausted warm shed air in cross flow or counter flow. The result is a conditioned fresh air with a temperature almost equal to the inside shed temperature. This conditioned air has also a lower humidity and has the maximum capacity to dry. The humid shed air containing CO2 and HN3 is not reused. 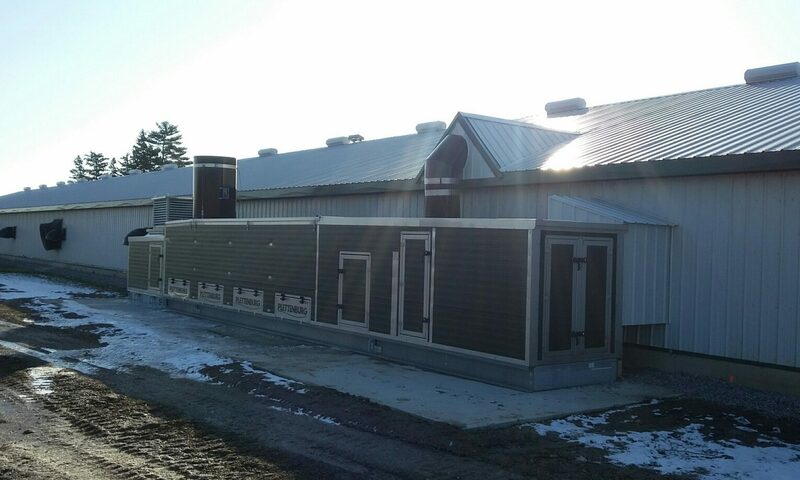 The heat exchangers can be installed either inside or outside the barn. For both options the shape and dimensions were chosen carefully to get the optimal heat recovery. The centrifugal fan moves the outside air. The outside air passes through a stainless steel filter, through the inside of the plastic tubes towards the end of the heat exchanger. During its transportation through the system the air is heated or cooled. When the outside air needs to be heated, the axial flow fans exhaust the warm shed air along the outside of the plastic tubes. During the summer the hot outside air is cooled by means of sprinklers, which can spay (ground)water over the plastic tubes.